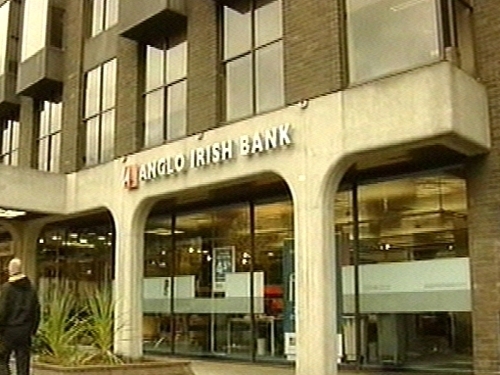 Anglo Irish Bank has written off €308m in relation to loans to ten 'longstanding clients', who then used the funds to buy shares in the bank. The ten individuals who borrowed the money subsequently became known as the 'Golden Circle'. The total amount of money lent to the 'Golden Circle' was €451m - but the bank may not get €308m of that money back. This morning, Anglo Irish released results which show a €4.1bn loss for the six-month period to the end of March. It warned that losses could reach €7.5bn over the next three years. The Government now plans to seek EU approval to put €4bn of State money into the bank in the coming weeks. Anglo Irish Bank chairman Donal O'Connor admitted its lending had been imprudent and the results very disappointing. He said total loan losses are likely to reach €7.5bn. Among those losses disclosed today €31m on loans to former directors. Minister for Finance Brian Lenihan confirmed that up to €4bn of State money would be invested to recapitalise the bank. He said winding up Anglo, the third biggest bank in the country, was not an option. Minister Lenihan said the priority has been to stabilise the bank. The results show deposits from businesses in Anglo dropped by almost €9bn after nationalisation.